It’s been a busy weekend and as a result it’s gotten to Sunday afternoon before I’ve had the opportunity to be tap-tap-tapping away in my front window. But it’s been a weekend of some new experiences which I want to share with you. The first happened yesterday afternoon when I went to have my very own studio photo shoot at insspire in Clapham. Prompted by a couldn’t-resist deal on living social (and the fact that since I’ve had my hair cut short again, I do not have a lot of photos that actually look like me), I’d booked my session several weeks ago and so yesterday found me strolling up Lavender Hill in the afternoon sunshine feeling excited and just a tad nervous. Taken in hand by the lovely (and official Master of Photography) Monika, first it was into make-up. I don’t wear very much of this on a day-to-day basis so it felt rather Hollywood to have someone else doing the primping and preening for me – although it was a little disconcerting to have that same someone peering at my face wondering what she could ‘do’ with it. Half an hour later it was back downstairs to the studio to start shooting. What can I say except that it was fun and very, very weird. There was lots of standing, sitting, leaning, lying and draping – and yes, that was all me! Monika spent an hour coaxing me into different poses and faces: there were lighting changes, set changes, costume changes (well, just one – I changed my top) and even a camera change! I left feeling a little tired, a little emotional, a little curious to see how the pics come out (viewing is not until the 19th July so stay tuned!) and a lot exhilarated. Let’s just say that the small top-up Sainsbury’s shop I stopped to do in Wimbledon on the way home took a little longer than it usually does. The second new thing for this weekend is that I have continued my foray into the The Great Bake-Off with a new challenge. We are off to Kew the Music at Kew Gardens tonight and part of the deal is that we all bring stuff along to share. A-down-the-hill let me know yesterday that there was marinated chicken, frittata, olives and snacky things and chocolate whoopie pies already on the menu so this morning I was whipping up a batch of Raspberry and Coconut Cakes (a variation on the Apple and Raspberry Squares I’d done previously). But this is not the new thing. Oh no! I baked TWO things today – yes two! I want to take this little beauty intact to tonight’s festivities so there’s a huge risk posed by the fact I have not conducted my usual taste test – but it looks completely wicked right? Time is a-ticking so I best be off to pack my baked goods and other essentials for tonight’s summer of fun (picnic blanket, folding chair, paper plates, plastic wine glasses, umbrella – yes sadly, showers are forecast). 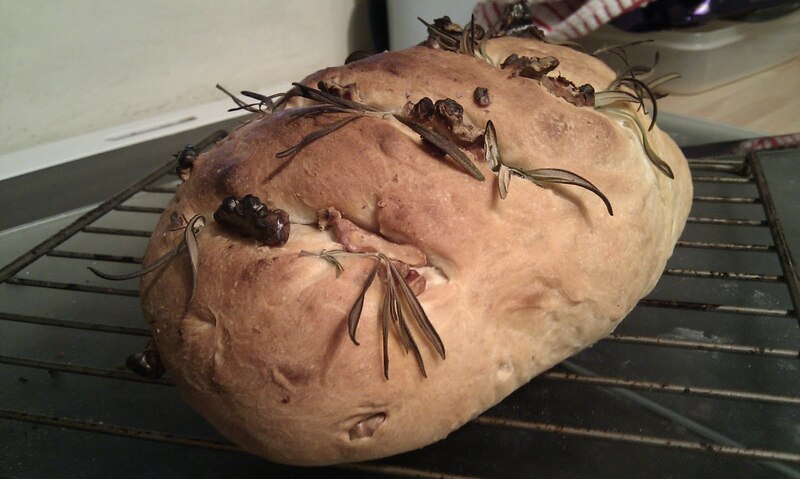 In the meantime, keep your fingers crossed for a dry evening and some tasty bread! ps…you’ve had a few days respite from the countdown but with only 22 sleeps to go before the good ship 41 goes into dry dock, I thought it would be very helpful of me to give you a little nudge. Best not stand next to the ship’s railing peeps – the nudging gets more persistent the closer we get and I wouldn’t want you to end up in ‘the drink’. Or would I? This entry was posted in Expat moments and tagged insspire, Kew Gardens, living social, sleeps to go, The Great Bake-Off, vouchers by Kym Hamer. Bookmark the permalink.